Knowing the exact weigh of your garage door is important! It would certainly be easy if you have the information from the time you purchased the overhead door or it is written in the manual. In a different case, it would be excellent to measure your door so that you can know what to do in case you need new garage door repair parts. Since the job of every single component of the system is centered on moving the door, the weight of the door is of the essence. If you are to replace rollers, for example, you'll need to know which size to get. If you're planning to replace the current door operator, you'll need to know how much horsepower the motor must have. Such things are associated with the weight of the door. 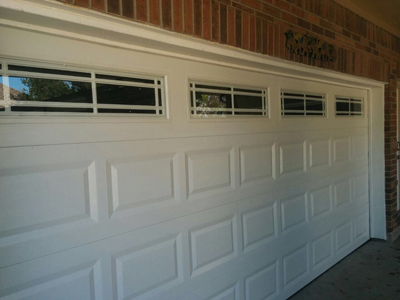 If garage door parts are not of the right size and are not chosen in relation to the door's overall size and weight, you'll probably have problems. Although the width and the height of the door are measured easier with the help of the measure tape, the measurement of the door's weight is one step harder. Still, it's even more important knowing the weight. How else will you purchase new garage door springs? Since springs actually lift and lower the door, its weight is of great importance. The task is not very hard but still troublesome and you will need various wood boards and a pry bar. Since there are some differences among them, wood and steel garage doors are measured in a slightly different way. 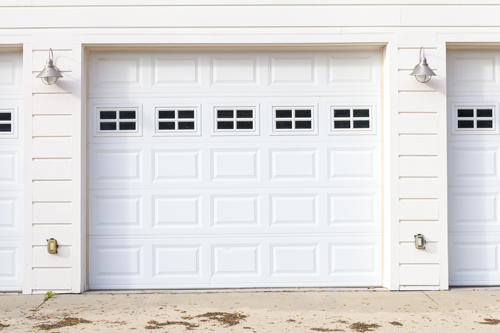 Unplugging and disengaging the electric garage door opener is the first thing you should do. You'll need an analog scale. If you see the sides of the door, you will notice that there are brackets. These make sure the garage door tracks are properly secured to the jamb frame. It's important to place a vise grip on one of these brackets at both sides of the door. With this action, you will manage to make the cables loose so that the weight of the door will soon rest on the scale. The lifting methods are different between steel and wood doors because steel could bend. In order to lift wood doors, use the pry bar at the center of the door in order to lift it enough to fit a 2x4 wood board under the door. Slide a fulcrum board under the pry bar. Then let the door sit on the board and remove the pry bar. Use the 2x4 board to slightly open up the door and raise it more with the help of the fulcrum board. Next, slide the scale under the door and lower it so that it will rest on the scale. Remove any other board from under the door and shake the panel a bit so that you can see the exact weight. Reverse the steps with the boards in order to let the door rest on the floor. Since steel garage doors bind, you should use the pry bar to lift the door by placing it under the bottom fixture at the side of the door rather than at the center of the door. Do the same at the opposite side, too. The door must be raised on the two ends and rest on wood boards of the same size. This will keep the door slightly raised so that you can place a longer board under the center of the door. Using the pry bar, you must lift the center board and place a medium board underneath it and then raise it a bit more with another board which will actually act as a fulcrum. Slide the scale under the door and once your remove the boards, shake the door and get your measurements. Then slowly remove all boards carefully. If you find the process difficult, ask help from Garage Door Repair Lake Elmo.